Lisa popping in to once again thank the very generous Concord & 9th for collaborating with us this month. We have had so much fun using their products, and I know that many of us, ahem, have made some more purchases of those products. I couldn’t resist. Have you seen their latest release? Their designs are so lovely, and the quality is fantastic. I can’t wait to see what big things come for them. I have a feeling they’ll be around for a long time. This month our challenge was one layer cards. We had some gorgeous entries. We thought we’d mix it up a bit, and show some of the ones that caught our eye here on the blog. 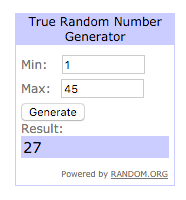 And then have random.org choose the winner of a prize from Concord & 9th. Loved the soothing colors of this one, and when you click on that link, you’ll find out that it’s actually paper from Concord & 9th. Fun! These beautiful flowers and the colors seem like it could be aged wallpaper. Wish I knew Priya and had a birthday coming up. Poppies! Made with colored pencil. Took our breath away. That is Megan Niegarth. And here’s her card. 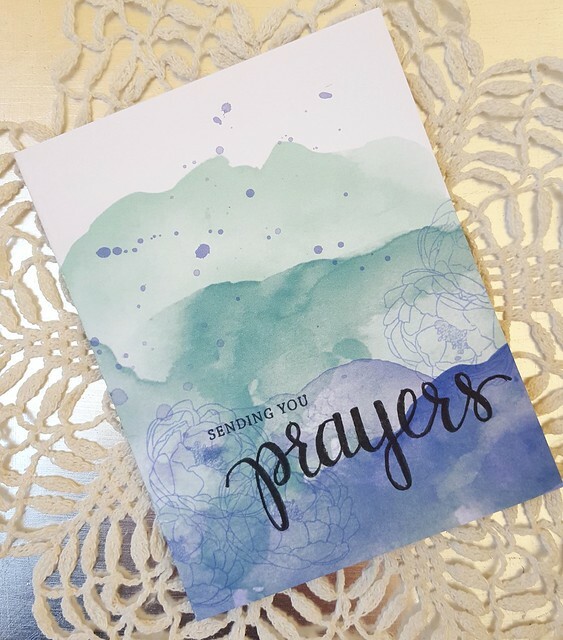 Love the use of the stencil, that new Prayers stamp set, and the colors. Well done Megan. Please send us an email and we will organize your prize. Thanks so much, everyone, for joining us this month. Come back on February 1st to find out about next month’s challenge. I bet you’ll like it. And in this case, I mean that literally. 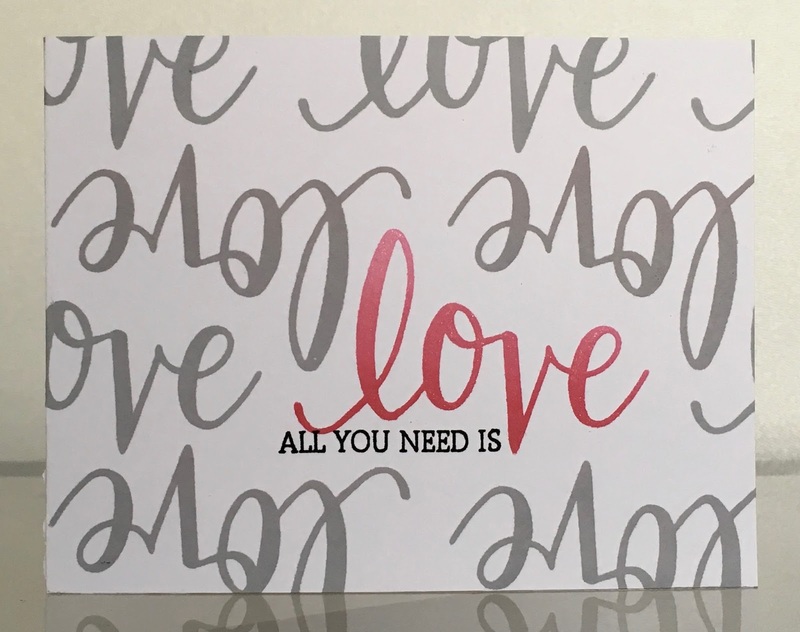 Just one stamp, the word “love”, and this card is made. It helps to have an amazing stamp set from Hero Arts, where cards practically make themselves. This was a pretty easy card to make, because I used the MISTI tool. I stamped the focal point first, using an ombre ink, then easily filled in the background using the MISTI. I used a fairly light ink, but was able to double stamp easily to get the coverage that I wanted. I know it’s an investment, but you won’t regret buying MISTI. For a little pizazz I added some Wink of Stella to the colored image. Love that it’s just the right amount of sparkle to satisfy my wishes. I plan to use this card to go along with a baby blanket that I’ve crocheted and am sending to a friend for his new baby girl. Thought the sentiment was apropos for a new little life brought into this world. Today is the last day to join our challenge. Click on the graphic below for all the details. Hello! The Crafty Nurse back with a collaboration project using Concord & 9th stamps and dies for the One Layer challenge here at A Blog Named Hero. A very special thank you to Concord & 9th for allowing us to play with their great product this month. I know I’ve already placed an order for more of their fabulous stamps! There is something about one layer cards that scream watercolor to me. I was inspired by a card made by Deepti Malik from a Craftsy course she taught on watercolor. This design paired so well with the Concord & 9th “Be Classy” stamp set, I made 3 cards! All the cards use the gorgeous Kuretake Gansai Tambi watercolors in #63, #64, #54 and a touch of #50 and #95 for the water and #42, #44 and #46 for the sand. The cards couldn’t be easier. 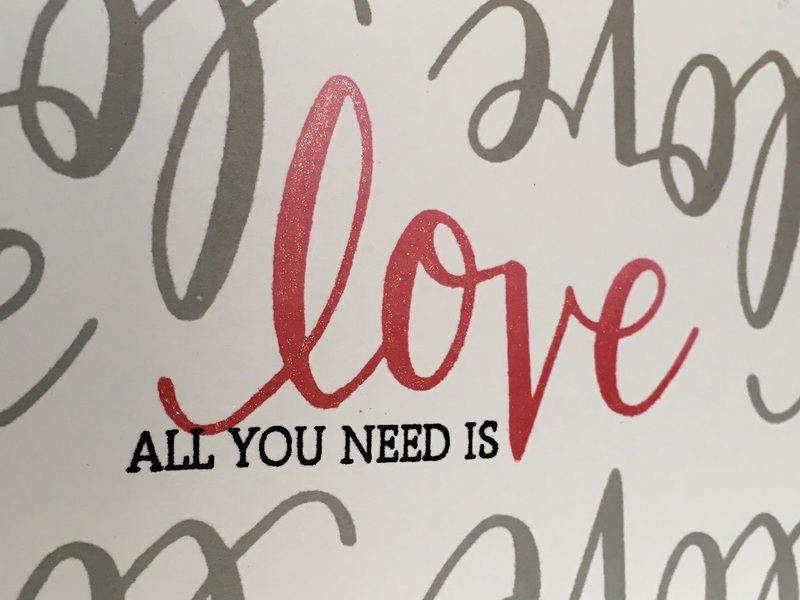 You simply lay down liquid friskit or masking fluid in a squiggly line to create the “foam” then apply watercolor with the deeper shades near the foam and finish with a sentiment. 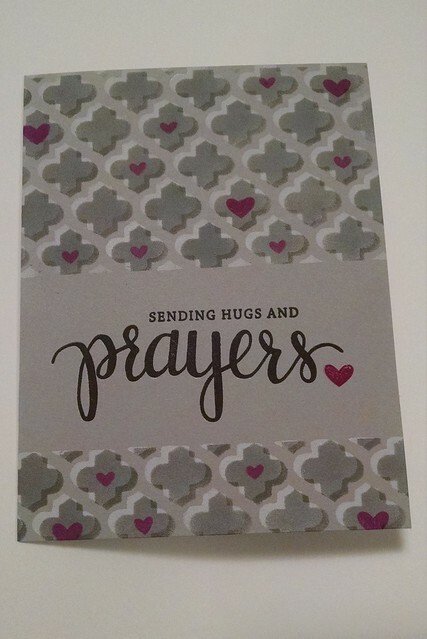 My second card again uses the “Be Classy” stamp set which I embossed and cut out with the matching “Courageous” die. For my 3rd card, I went a bit darker to show that you can alter the mood of your scene based on the amount of color used. Again I used one of many sentiments in the “Be Classy” stamp set. I hope you’ll join us at A Blog Named Hero for our January One Layer Card Challenge! We are thrilled to be collaborating with Concord & 9th all month and I hope you were as inspired I was! I stamped the Hero Arts swirl background stamp using Soft Granite Ink, on the bottom third of the card, masking it off at an angle. I then stamped the cutesy succulents from Concord & 9th, and the sentiment. That’s it for me! I hope you’ve enjoyed our month of collaboration with Concord & 9th! Thank you so much to the wonderful people there for joining us and offering up products for our lucky team to use, as well as a prize for one of YOU challenge participants! The winners for the challenge will be announced shortly. 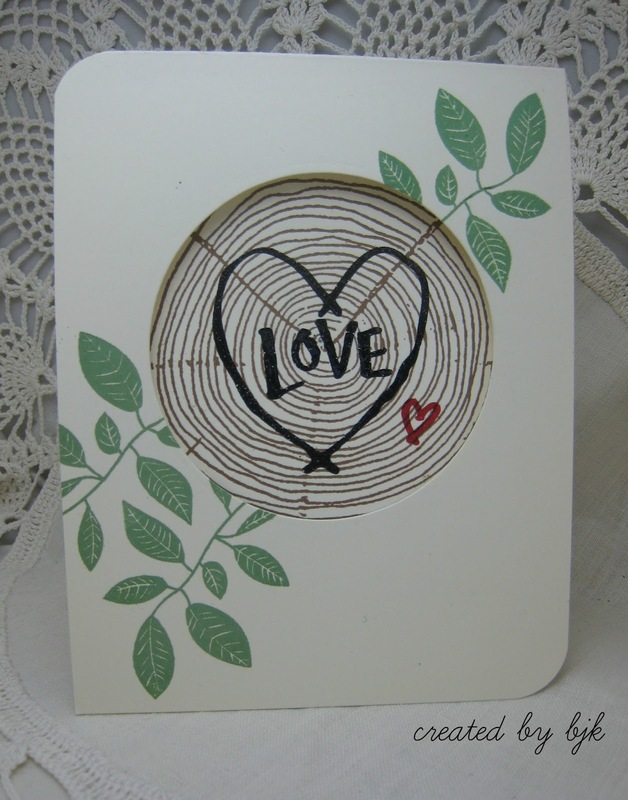 I used their cute new sentiment set, Tree Hugs, their Tree Ring stamp and Hero Arts Stamp Your Own Plant. I die cut the circle from the front and then centered the tree ring on the inside. Using the leftover circle as a mask, I stamped the leaves on the front. would have good ink coverage and then embossed with clear EP. This is going to one of my sons as a valentine – a good guy card don’t you think? There are still a few days left in January to enter our one-layer challenge and win a prize by entering here.